For just about the entire country, it has been a brutally hot Summer. Even though we are now fast approaching Fall, the weather is showing no signs of letting up. Not only are these extreme temperatures tough on us, but they are hard on our dogs as well. As pet parents you are likely aware of some of the dangers brought on by the heat. For starter’s dogs don’t sweat like we do, and are particularly prone to dehydration and heat stroke. Did you know, however, that high ground temperatures can pose a risk to your dog’s paws themselves? For the second post in our series of pet travel essentials, we are going to be taking a look at a few items that can help protect your dogs paws and ended up being a lifesaver on our recent dog friendly tour of America! The simple answer is yes! Although they may appear to be, it is a common misconception to assume that dog’s paw pads are much tougher than our own skin in regards to heat. Ground temperatures as low as 120°F can begin to cause pain, while 140°F can cause burns and scars after prolonged contact, and 150°F can cause rapid blistering. Just How Hot can Pavement Get? Believe it or not, the temperature of blacktop in the hot sun can reach 140°F! And it’s not just pavement that you need to be concerned about! Many other surfaces like cement, brick, sand and rock can reach temperatures that are easily hot enough to burn your dogs paws. Even leather car seats can reach 150°F! Well, you could always pick up an infrared thermometer if you want to be fancy. (Surprisingly these aren’t that expensive and a ton of fun to use!) All you need to do is hold the gun between 1″ and 12″ from a surface and pull the trigger to get an accurate reading of the temperature. Technology aside, there is another quick and easy test to determine whether or not a surface is too hot for your dogs paws. All you need to do is place the back of your hand on the ground. If you are unable to keep it there for 5 seconds, the surface is too hot for your dog to walk on. Please remember that looks can be deceiving. Although darker surfaces tend to absorb more heat, that doesn’t make lighter surfaces free from danger. All it takes is a few seconds to ensure that you are leading your dog into an environment that is safe for them. How do you go about Protecting your Dog’s Paws? Walking on grass or at cooler times of day is a big help – Unfortunately this is not always feasible. 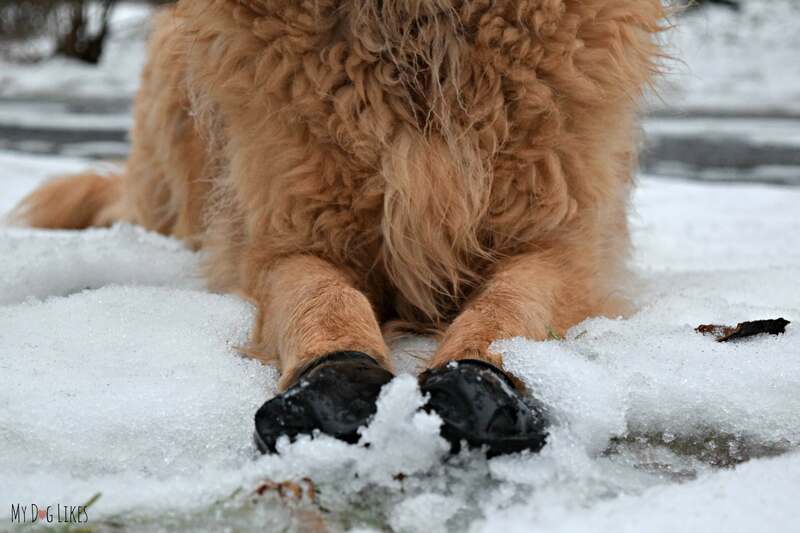 The good news is that there ARE a couple of simple ways to help keep your dogs paws safe in these extreme conditions: dog booties and paw wax. It just so happens that our favorite version of each are made by the same company – Pawz – who were kind enough to sign on as the official Paw Protection Sponsor for 2016’s Road Trip! I’m sure that you have seen dog boots before, but perhaps not like these. 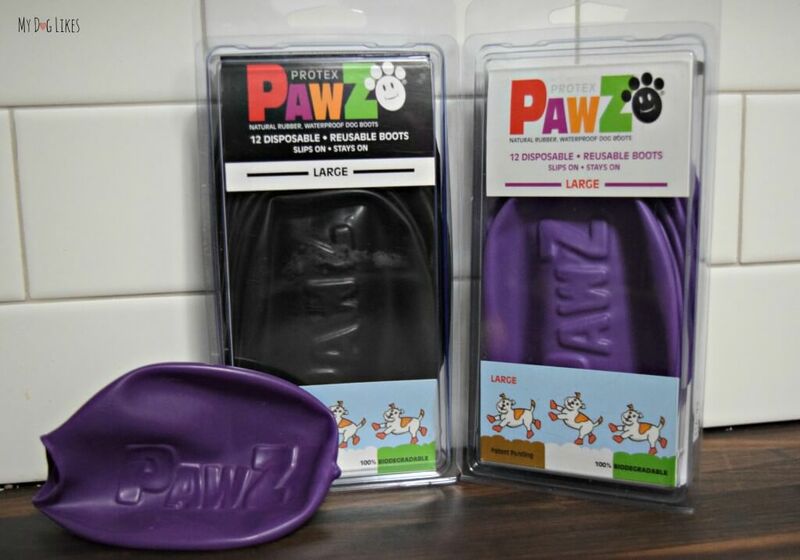 Pawz dog booties are made of a thin rubber and look more like balloons than what you would picture as boots. The huge advantage of Pawz boots is how easily most dogs will adjust to them. Because they are so thin and flexible, dogs can still feel the ground beneath them – as opposed to canvas style boots which prevent such tactile sensation. Pawz come in packs of 12 and would be classified as semi-disposable. This is because they are designed to be worn until they develop a tear or are lost. 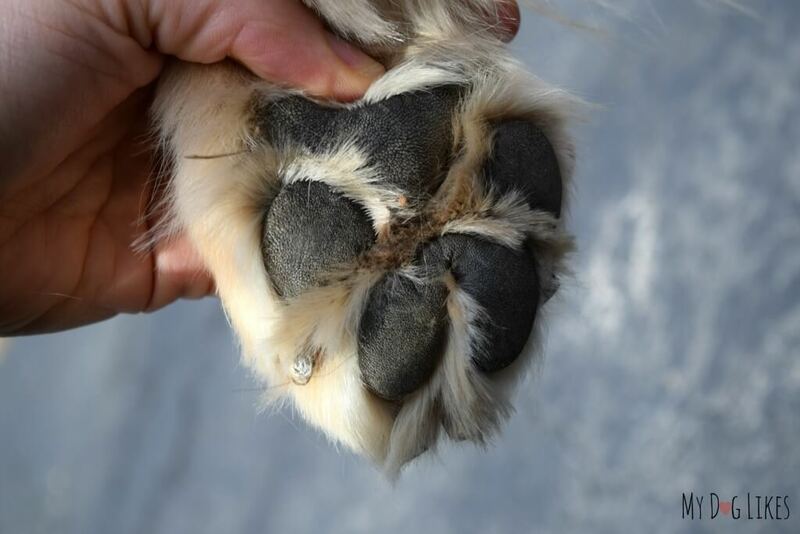 No need to worry however as Pawz are inexpensive and formed from a biodegradable natural rubber. We have been using Pawz dog boots for several years, but primarily for protection against snow and chemical ice melt. Living in the Northeast, we don’t often run into the extreme temperatures that we described above. When our road trip rolled around this was all about to change – The first stop of our trip was the BlogPaws Conference in Phoenix, Arizona where the temperatures were forecasted to be in the 110’s! 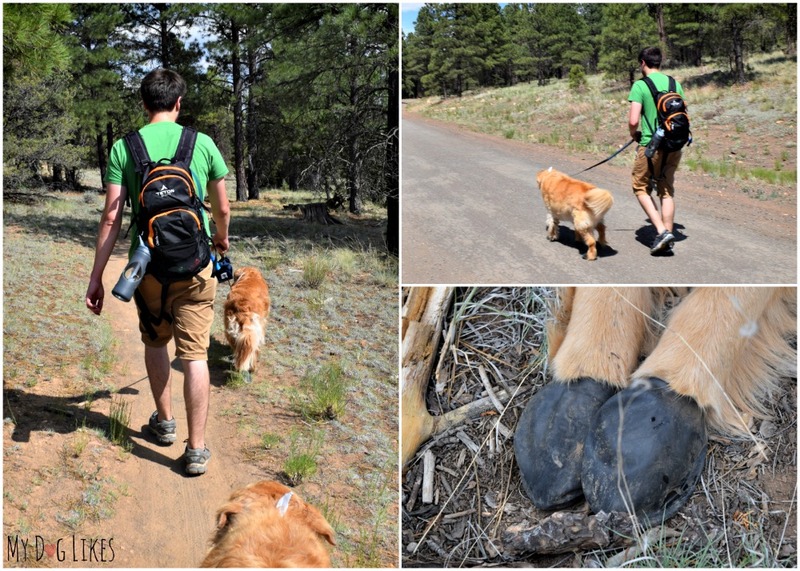 We utilized Pawz throughout the entire trip – whenever we were hiking midday or the temperatures exceeded safe levels. They are a simple and effective way to prevent your dogs paws from coming into direct content with concerning surfaces. It should be noted that they are not foolproof however, and extreme temperatures may still be felt though the rubber. We actively worked to avoid blacktop in harsh temps and would certainly recommend that you do the same! Remember that dogs will often ignore pain in order to please us so use common sense, check the ground frequently and watch your closely for signs of discomfort. This could include lifting of paws, licking of the pads, or quick movement onto different surfaces when given the chance. 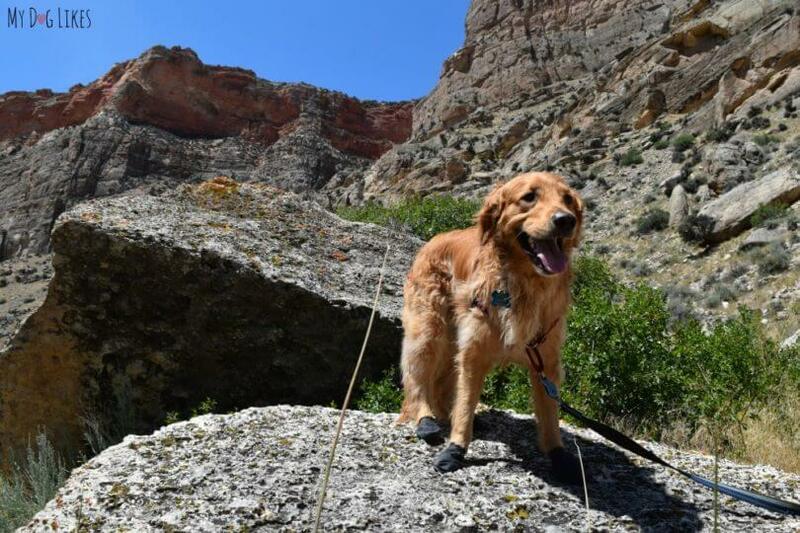 One other tip we received from our good pal Sugar the Golden Retriever is to poke a small hole in the bottom of each Pawz boot. This is because dogs sweat through their paw pads and a bit of air flow will help prevent moisture from building up inside. 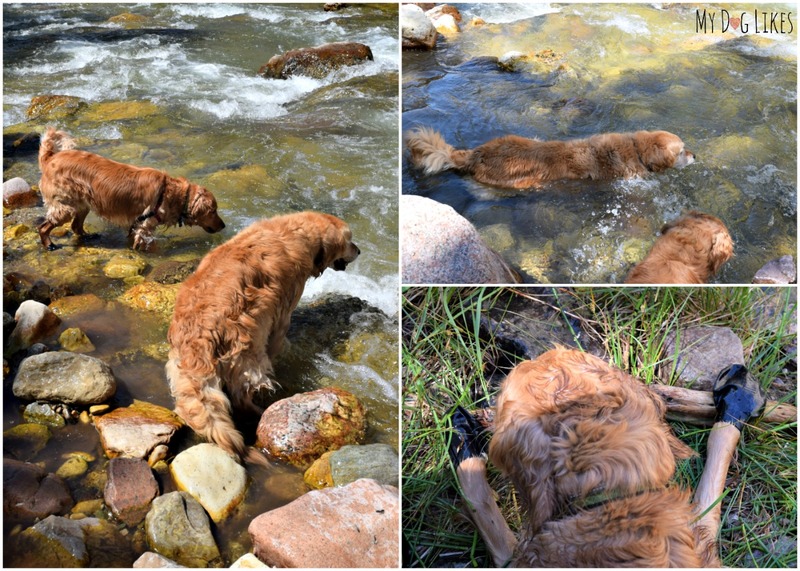 Non Slip – We did a fair bit of hiking through creeks and found that the rubber booties helped to give the dogs traction on the wet rock. We also loved that they are thin enough to allow for the dog to spread their toes if necessary for grip on a curved surface. 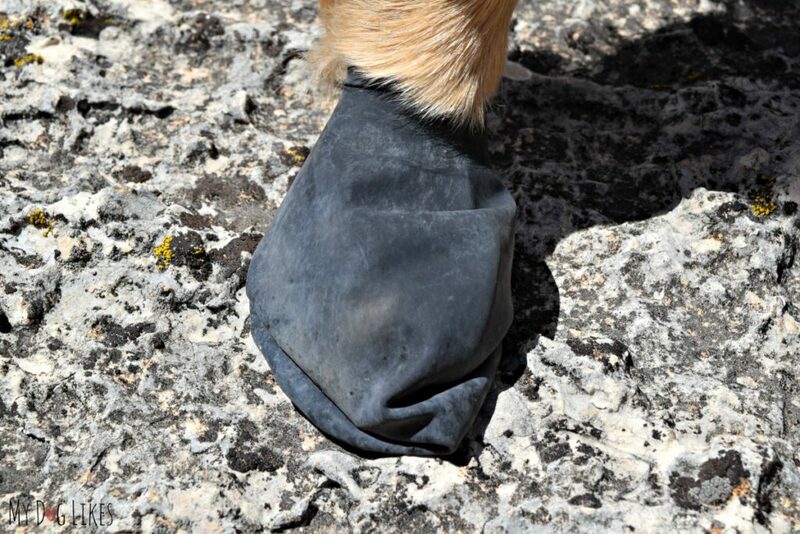 Protection – Pawz also provide a thin layer of protection against incidental cuts and scrapes from sharp, jagged rock. 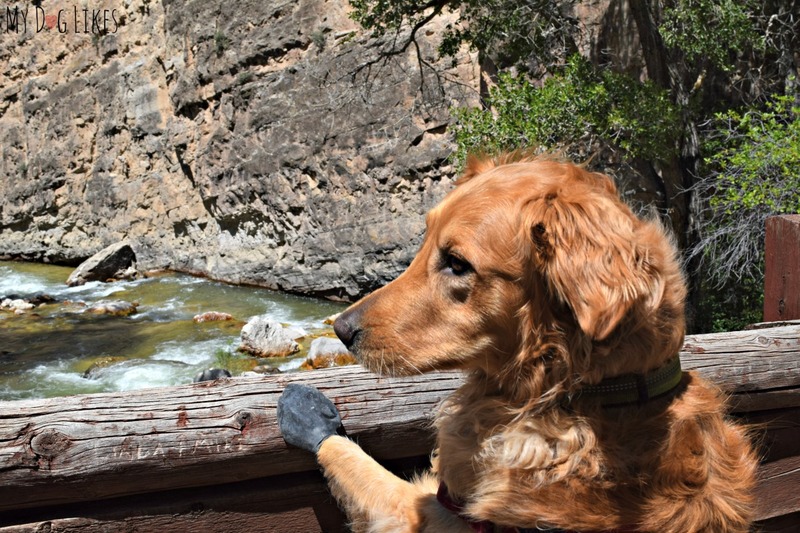 We spent a lot of time hiking on gravel trails and over boulder covered hills and never had an incident with a stone in the paw or developed cut. Another great option for paw protection in the heat is a quality paw wax like Max Wax from Pawz. This all natural salve provides a thin protective barrier between your dogs paws and the environment. The only issue is that it will wear off as you walk so reapplication is key. We would primarily recommend using the wax for short treks over hot surfaces. Max Wax is also excellent for moisturizing and healing minor scrapes and dry skin – something that is perfect to cap off a day of hiking. Hydrated skin is also less likely to crack and bleed the next time your dog is out and about. Last but not least, this wax is completely non-toxic so you need not worry if your dog attempts to lick their paws after application. It is our responsibility as pet parents to keep our animals safe and that includes being aware of “unseen” environmental hazards. 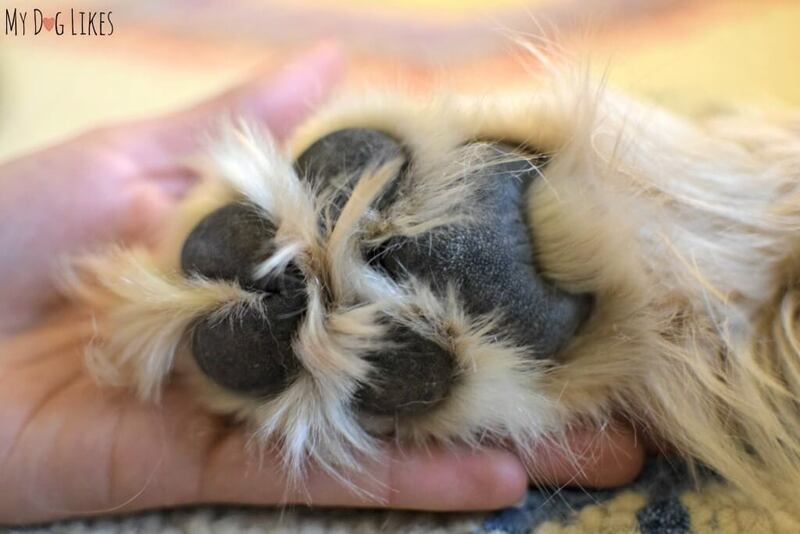 Ground temperatures in the sun can easily reach dangerous levels, but all it takes is a quick check and some preparedness to make sure your dogs paws are protected. 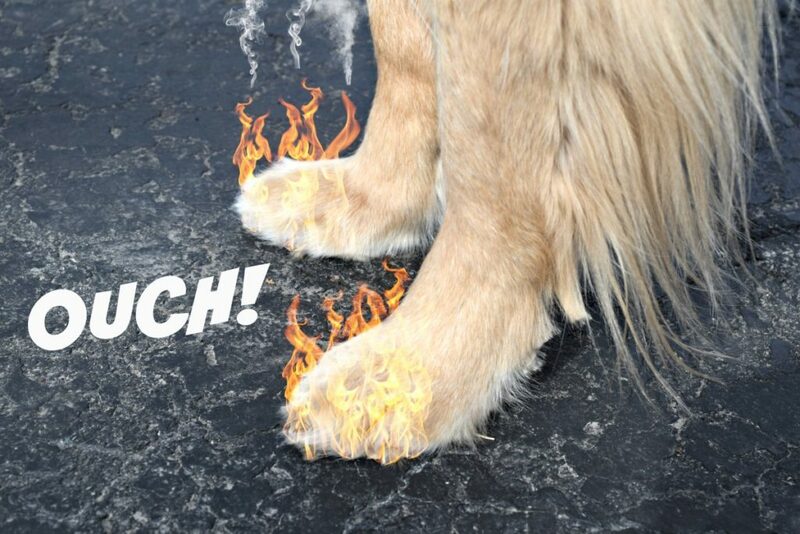 That is why we highly recommend using Pawz boots when encountering hot surfaces and Max Wax to help repair and heal any incidental damage that may occur while adventuring! Click here shop Pawz on Amazon! Has your dog ever had problems resulting from high temperatures? Do you have any other hot weather tips for paw protection? Let us know in the comments below! We don’t need the for heat around here as we don’t spend much time on pavement in the sun during the hot months but we do use them in the winter for wet snow, or more than -10 times. They are handy boots. Great post! We use these as well, mostly to protect our older dog paws when he is on walks (all year round).